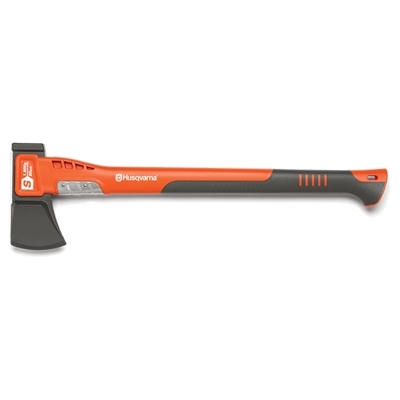 Husqvarna splitting axe made for splitting firewood logs. The Husqvarna S1600 axe head has a non-stick coating which gives less friction and easy entry into the wood and the head geometry is adapted to the application of splitting medium- sized logs. Handle protection and long life due to the stainless steel shaft protection. Balance point close to the splitting axe head gives perfect balance and weight distribution. The combination of the optimized axe head and the light shaft concentrates the power into the cut which gives an easier split of the logs. Fiber-reinforced PA shaft makes the axe durable and robust. Hammer function for an easy and effective use of splitting wedges (no steel wedges).